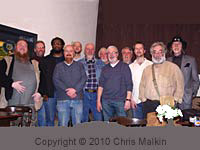 The MEETINGS pages report on all our Gatherings, like this one in June 2010, our annual Midsummer Beardness Sunday Lunch at The George Inn, London. The GALLERY pages for each area of the country and the world, show off the interesting faces of many of our hundreds of members. 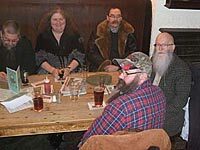 The DIARY page shows our upcoming dates for Gatherings and other Club functions, such as our AGM and various Beard Competitions not only in the current month but for the next several months, and is updated as soon as we have new information. 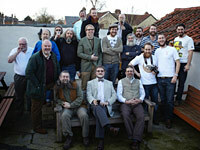 The JOIN US page summarises the advantages of Membership of The British Beard Club, and offers the online Membership Application Form, with notes to help you fill it in. The MEMBERSHIP MAP page shows where our Members are in The British Isles and in Overseas countries of the World. Each pin in the zooming map represents one or more members in a town or county. The VISITORS BOOK page is where you can leave a comment on anything you have seen on our site. The MEMBERSHIP FORM asks for your name and address and other always-kept-confidential contact information, and invites you to tell us about your interests and activities. Feztivities Developed at The Devonshire Arms in Cambridge on 10th December when a crowd of befezzed Club members met up for drink and chat. 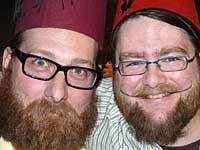 Stace (left) with Guy were two of the many magnificent beards and fezzes to surprise the locals, and an excellent evening was enjoyed by all. 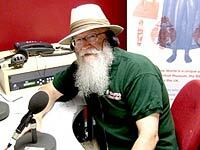 BBC Radio Ulster chatted to members meeting in Coleraine on August 31st about all things bearded! 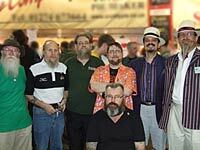 The Annual TBBC Earl's Court Gathering at CAMRA's Great British Beer Festival took place on 6th August. 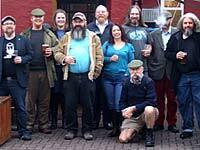 We drank pints, ate wild boar pies and recruited new members from interested passers-by to our table. Next year the event is to be held at Olympia, which should be cooler, quieter and just as much fun. 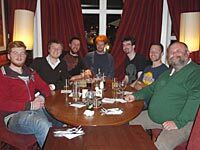 The latest Gathering at the Devonshire Arms in Cambridge was a very enjoyable Sunday afternoon, with excellent roast beef rounded off with photos outside. We were lined up outside next door: The Confidential Shop. Don�t ask what they sell � it�s confidential! 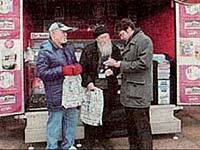 Your Hon Pres fielded questions from BBC Humberside presenter David Burns and BBC Linconshire's Melvyn Prior about beards. Click each triangular play button to listen. Twenty-six members and friends met at The George Inn, London for our annual Midsummer Beardness Sunday Lunch on Sunday 19th June. The changeable weather didn't dampen our spirits, or beers, and bangers and mash was a favourite choice for many. We gained new friends, new members and a new numbers record. 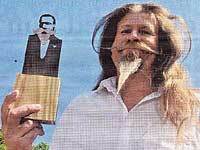 Member Frazer Coppin from Rivenhall in Essex has become sought-after by newspaper reporters after his friendly feud with fellow Musketeer-category contestant Jürgen Draheim at the 2011 World Beard and Moustache Championships in Trondheim, Norway. 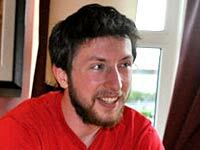 David Alcorn, founder of the Northern Ireland branch of our Club, talks about his passion for Beards and The British Beard Club to BBC Radio Ulster's Ronan Lundy. HON PRES IN LOCAL PAPER EXPOSÉ! "THE MAIN THING I SUPPOSE YOU DO, IS NOT SHAVE!" 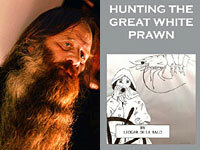 Radio Leeds' Bob Walmsley talks to TBBC member Ledger De La Bald about his new book Hunting The Great White Prawn, and about The British Beard Club. Click the title above to hear a longer version. 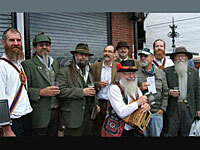 Stoke-based String Fing's combination of Folk & Blues music seems to attract a Bearded Audience. Band and Club member Terry (right) and friend Steve (left) thought it might be a good idea to do an impromptu photo shoot in the break, and almost everyone with a Beard was eager to take part. DID NELSON EXPECT EVERY MAN TO GROW A BEARD? 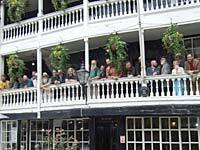 The Lord Nelson Inn in Brighton was the venue for our late November Lunchtime Gathering on Saturday 27th November. Harvey's ale, Nelson-burgers and appetising sandwiches were on offer - and the chill outside meant we ate in the Gallery and then moved to a long table close to the open fire in the bar. 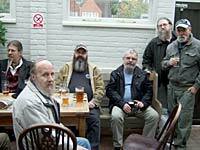 Members Gathered at the Filo in Hastings, East Sussex on 17th October for beer-tasting, then on to 16th Century hostelry The Stag Inn for lunch, more beer and good conversation. 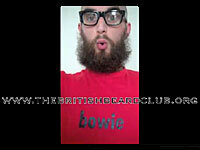 TBBC Member Lee Burgess from Doncaster, Yorkshire presents his 8 month beard growth progress video. You have to watch this particular video on Youtube itself. 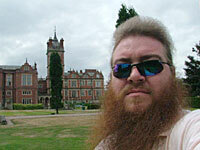 There are more videos and self-portraits on his own Web site. Member Steve Meigh from Stoke on Trent texted Radio Stoke presenter Amy Clowes; she puts our Web site on air and on Facebook. Click on the small triangular play button in the player below to start. A short tongue-in-cheek video presented by Facebook documenting the first Northern Ireland regional Gathering of The British Beard Club. 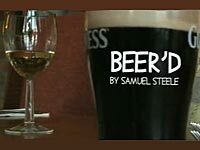 As the beer flows, so does the conversation. Music by Pevin Kinel. 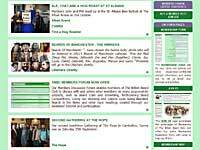 Read our earlier news items.